Hi lovelies. Apologies for my absence. I spent the last week getting ready for my trip to Indiana with miss E. Traveling with a new born is a new thing for me so I had endless check list and repacked like 3 times but still ended up with an overweight luggage at the end of the day. The whole travel experience is a story for another day. Ok, on to the outfit. 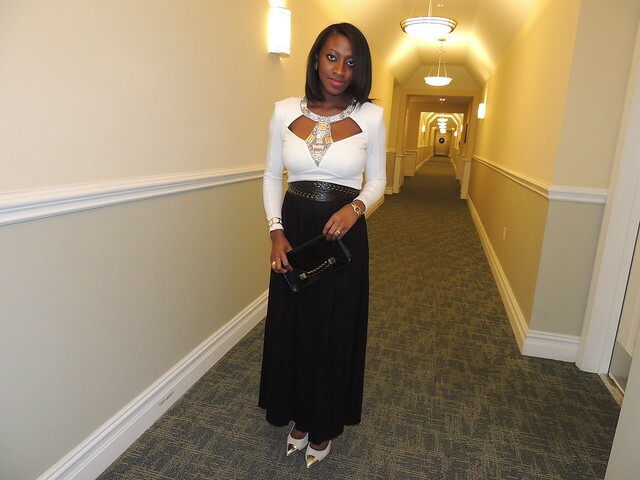 I wore this outfit for a formal event about a week ago. One of my first thoughts when we receive an event like this is what to wear. And then, I get in that mood of I don't have anything to wear. But thankfully, that wasn't the case this time. Mostly because I wasn't sure if I was going or not. It was said to be adults only on the invite. Only to find out last minute that infants are ok to attend. With that, I had no time to complain about not having anything to wear. Tried on a couple of my old dresses but my body isn't ready to fit in them yet. So I picked out this very mini dress. 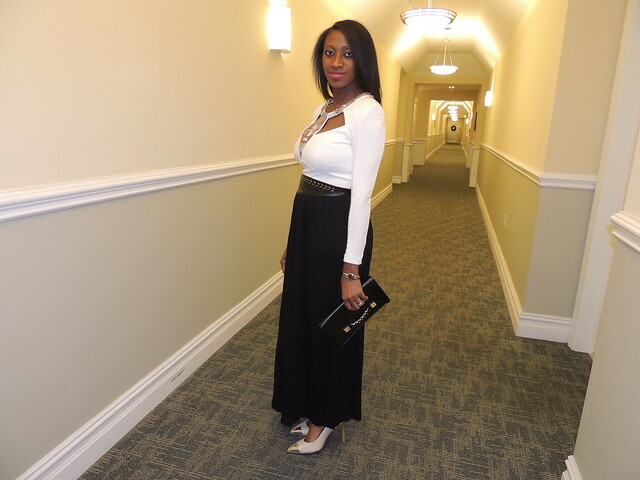 Knowing I dare not wear it as a dress like it was meant to be and like I have worn it several times before, I turned it into a top and paired it with my basic black maxi skirt. 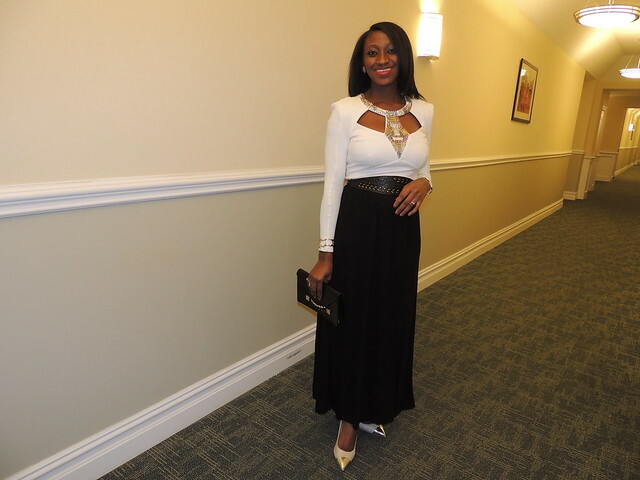 Once I tried it on, I loved the pairing, so I added the embellished belt to the waist line to tie both pieces together and instead of a black heel, I opted for an ivory cap toe one. 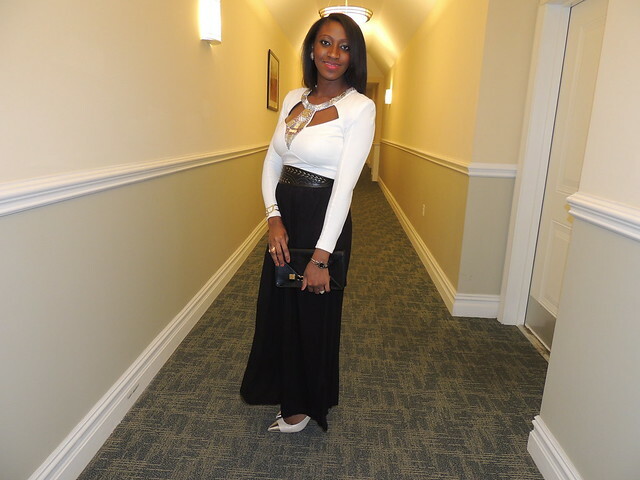 One of the things I love about this look is how the dress, more dressy and structured worked so well with a very basic pleated maxi skirt and in the process, transformed the skirt to something more elegant. I have to say I love when I pull out stunt like this from pieces that I might otherwise throw in the donation pile. 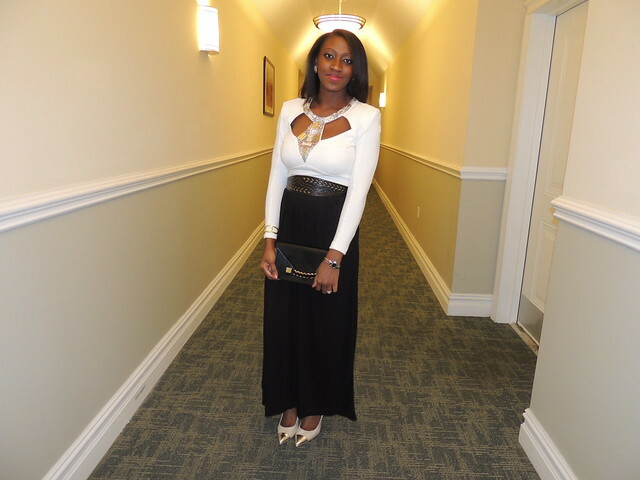 This outfit gave me the motivation to hold on to a few more of my mini dresses and see what I can do with them; and for this dress, can't wait to pair it with a colored or different style of skirt. Hope everyone is staying warm and getting in the holiday spirit. And Christiana is back!! You look nice...very very.